Zhongdian (Xianggelila/Shangri La): I hate to beat a dead horse, but if my internal clock doesn't speed up any faster I will be on China time on or around October 15th, the day we return home. We got up and had a leisurely breakfast, meeting a group of three couples from the states who have been in China and Tibet for the last three weeks with another three weeks to go. We enjoyed out short exchange of experiences with them. We got a later start today with unanimous agreement, giving up a tour to a lake and grassland area in favor of spending more time in Zhongdian (Shangri La). We were very glad we did. The weather was great with lots of blue sky and big puffy clouds. Our first stop was the Tibetan Buddhist Monastery and Temple, Songzanlin, just north of town. It is one of the largest monasteries outside of Tibet. For more information see below. The monastery area surrounding the temple itself is largely under reconstruction. Remodeling of the t emple itself has just been completed. Our tour guide who is from the Tibetan minority was very specific on what we could and could not do. When entering the temple you always step into the temple with your left foot and always leave with your right foot. No picture taking in the temple areas. Pictures may not be taken of the older living monks as it would rob them of specific life attributes. It was OK to take pictures of the younger monks. Every Tibetan family must send one of their sons to the monastery to become a monk. During their trials and education their families must provide all of their daily food. If after 30-35 years they fail to pass all of the trials to become a living Buddha, they must return to the family of his oldest brother and his brother must share his wife with him. Our guide went into much detail on all of the different Buddhas over the centuries, what their roles were on this earth and what contribution they made to this temple. The building and interior of the temples were elaborately painted with wall size murals of the many buddhas in a great variety of colors and poses. The crowns of the roofs were elaborately painted with real gold. The Tibetan women still wear their native dress. Some of the younger women use their very young children to make money by making you pay to take their picture. I had a lot of fun with them and had more success by just making the kids smile with a finger wave a smile followed by a gold wrapped Almond Roca. We would just ignore the mothers who wanted money because the other 90% were friendly without the financial bribery. This area is one of the areas that the Chinese government is having problems controlling births, limiting each family to one child especially with the farmers. It was interesting to see the masons working outside the monastery chipping away at the stones to be used in the new construction at the foot of the monastery. A note on the town of Zhongdian itself....the town has gone through a major reconstruction over the last two years and from our observations was a very clean fresh vibrant town. After checking out of our hotel, we visited the Old town and the town market which was alive and full of every product you could imagine. We viewed the huge prayer wheel at the top of the hill above another Buddhist temple. It takes eight people to turn this prayer wheel. On the way back to our van we enjoyed a leisurely cup of local Yunnan coffee bean coffee. On the way out of town we stopped to have a long distance view of the monastery and then continued to Shu He, an old village just outside of Lijiang that has been enhanced by becoming a movie studio of sorts. TThe road back from Zhongdian had many mudslides that were not there yesterday along with evidence of heavy rain. We have been lucky. We even got a brief glimpse of Jade Dragon Snow Mountain from the west side. We also stopped and got a long distance view of the first bend of the Yangtze River. The river is flowing in a South South Easterly direction and then makes a sudden change in direction to the Northeast. I firmly believe that the center dividing line down the road is there as a guide for all drivers to drive as close as possible down the center of the road. I am also convinced that all drivers stay in the passing lane (oncoming traffic side of the road) to see how close they can come to the oncoming vehicle before returning to the right side of the road. The hotel here (Lishui Yang Guang) is nice but the rooms are smaller, the staff is very friendly and all of them from the front door men and up greet you with a short bow of the head and a hello. This is the first hotel where we have had to pay for bottled water. After dinner in the old town we got rained on during our walk back. Hope it clears up tomorrow so we can get a full view of The Mountain once more. To its majority Tibetan residents, the capital of the Diqing Tibetan Autonomous Prefecture, a small town on the road between Li Jiang and Tibet, is known as Gyalthang. To the town's smaller Han population, it's still called Zhongdian. To tourist authorities, hotel owners, and tour operators around the country, the town is now the earthly paradise of Xianggelila (that's Shangri-La to you). A rose never had it so difficult, and we'll continue to refer to the destination as "Zhongdian" in practical information. Zhongdian was officially renamed Xianggelila in May 2002. For now this is still a small, dusty town (elev. 3,380m/11,092 ft.) to be visited mostly for its Tibetan monastery if you aren't going to make it to Tibet. The surrounding area, however, does offer some spectacular scenery. Songzanlin Temple (Lama temple): The largest Tibetan Buddhist temple in southwest China, Ganden Sumtseling Gompa (Songzanlin Si) (¥10/$1.25; open 7:30am-6:30pm), is located 3km (2 miles) north of town. 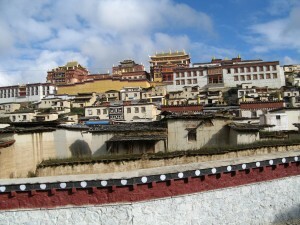 The Gelukpa (Yellow Hat) monastery was built in 1679 by the fifth Dalai Lama. Modeled on the Potala Palace in Lhasa, the temple was shelled by the Chinese army in 1959 and officially reopened in 1981. About 700 monks currently reside here. 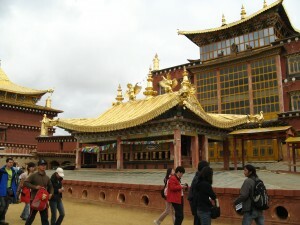 The main temple at the top of the hill, a four-story structure with a gold-plated roof reached by climbing a series of steps (or you can have your taxi drive you up to the north entrance [beimen]), has a solemn main hall with 108 red pillars and scores of colorful thangka hanging from the ceiling. Ascend to the roof, where a simply glorious panorama of Zhongdian awaits you. In the living quarters of the Living Buddha, check out the smooth marks along the floor, where thousands have prostrated themselves in front of the Lama. You may even be able to find a monk who can point out the nearby mountain to the south used for Tibetan sky burials. Returning to town on Changzheng Lu, you'll see a large white chorten (Tibetan stupa) on a hill to the west. There is typically a stupa at the entrance to every Tibetan town which, as a symbol of protection, is usually decorated with prayer flags and jewels, and ringed with stones laid by pilgrims as expressions of particular wishes or prayers. 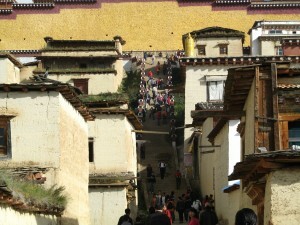 Pilgrims entering town are required to circumambulate the stupa three times.